Investigation into mysterious Cuba attacks "back to square one"
Nearly a year since attacks targeting American diplomats began in Havana, Cuba, U.S. investigators are no closer to determining either the source or the methods, according to officials close to the investigation underway by several agencies including the FBI and CIA. "We thought we were close but they are back to square one," according to a source familiar with the investigation. State Department kept quiet for months about Cuba "health attacks"
"My own multiple sources are saying that some of the evidence, medical evidence, being shown by the patients that have been affected could not all be related to sonic waves," said Dr. Andy Gomez, interim director of the University of Miami's Institute for Cuban and Cuban-American Studies. "What other measures did whoever the perpetrator was committing these acts do to cause these health issues with our U.S. personnel in Havana?" The State Department says the attacks have affected 22 Americans since they began last November. Medical records examined by CBS News show some Americans suffered mild traumatic brain injury, cognitive problems, hearing loss and other health issues. The victims include a handful of Americans connected to the U.S. intelligence community, according to sources. 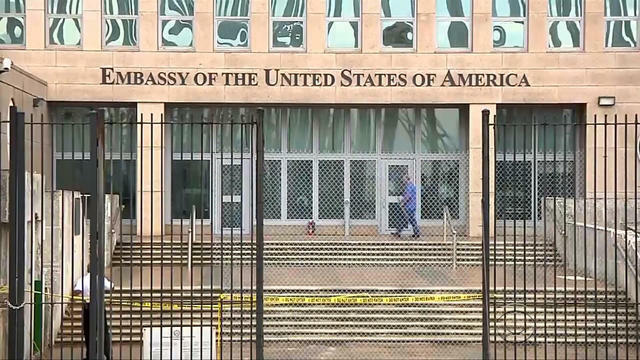 The U.S. has ordered most of its personnel and all families to leave Cuba, and is expelling a proportional number of Cuban embassy officials from its embassy in Washington. But the U.S. has stopped short of blaming Cuba for the attacks, as investigators consider whether another country could be involved. But Senator Marco Rubio, R-Florida, told reporters Wednesday after a closed-door Senate Foreign Relations briefing on the attacks from the State Department and CIA that he does not believe denials from the Cuban government, which says it has nothing to do with the attacks. "The idea that an environment like that, like Cuba, especially in Havana, 22 Americans could be attacked and the Cuban government not know who did it, is absurd," he said. Cuban Foreign Minister Bruno Rodriguez has dismissed U.S. claims about the attacks. Rodriguez told reporters in Havana on Tuesday that "no evidence of the alleged incidents, their source or origin exist." No one from the Cuban embassy in Washington or its mission to the United Nations in New York has responded to questions from CBS News. "I have to assume, given the steps the United States has taken, that there's enough proof to point in the directions that the Cubans were involved and knew about it," Gomez said.